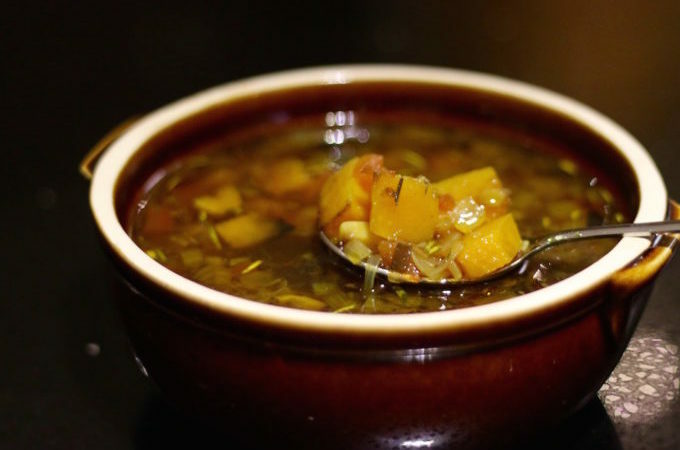 Roasted butternut squash in a mildly seasoned broth with onions and tomatoes, this clear butternut squash soup is perfect for a night when you just want to tuck and sleep in. I love the flavors and textures of this clear soup as all ingredients perfectly balance each other. Yesterday the evening had a slight chill to it and it seemed like a perfect time to make some soup. I love roasting earthy vegetables like butternut squash, pumpkin, sweet potato, and carrots. Roasting caramelizes and enhances their natural sugars. 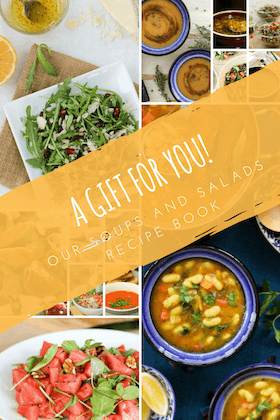 A lot of my winter salad recipes have roasted vegetables like the lentil salad, south-western bean salad, or the roasted chickpea salad. Normally my method for preparing cream soup is to cook the vegetables and then blend them until smooth. That is exactly what I had in mind when I started cooking for this soup last evening. 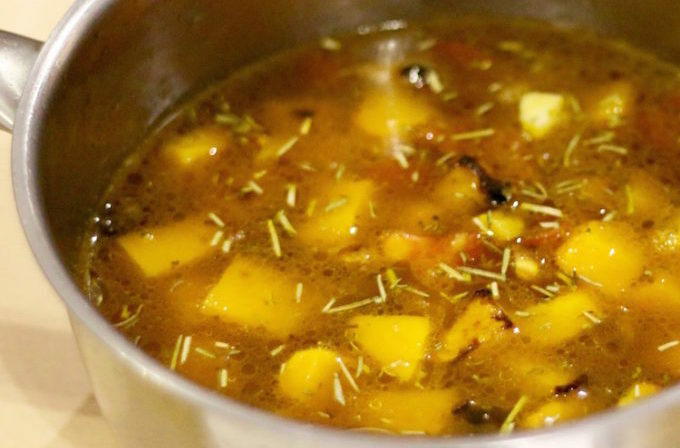 I roasted the squash along with thyme and rosemary and had onion-tomato broth ready. Then I added the roasted squash to the broth and before blending it all together, just decided to give it a quick taste. In that one bite, I could taste the onions, the tomatoes, the garlic, and the squash, individually. Each had its own texture and flavor and together they all complimented each other perfectly. At that moment the butternut squash soup turned into a stew or more like a clear soup. 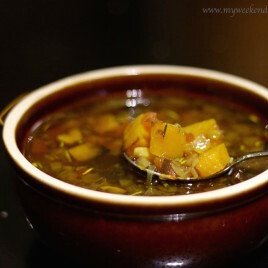 I love the myriad flavors and textures in this beautiful stew and I hope you would too! If you like this recipe, please take a moment to rate it and/or leave your comments at the end of the blog. It will really encourage me to keep exploring, learning and improving. Preheat oven to 220ºC. 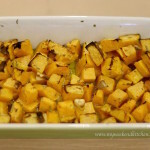 Put the butternut squash pieces in an ovenproof dish. Add the chopped garlic and dried thyme and rosemary. Drizzle 1 tbsp olive oil. Mix well and roast in oven for 15 mins. Heat the remaining 3 tbsp oil in a deep pot. Add the onions and green chilly. Sauté for 5 mins till the onion becomes soft. Add the chopped tomatoes and cook for another 5 minutes. Add the roasted butternut squash and garlic along with all the juices into the pot. Top with the stock. Mix well and bring to a boil. Reduce heat and simmer for 5 minutes. If you want to make a soup, use a stick blender to blend the stew into a thick soup. Add more water if required. Ladle into soup bowls and serve hot.